Lehigh University’s Mountaintop initiative brings teams of students together for 10 weeks to explore a new model of education: an interdisciplinary experience focused on self-directed, open-ended questions and developing their own projects. Students take over the 50-foot-high industrial spaces that were formerly the state-of-the-art research laboratories of Bethlehem Steel, bringing and developing their own ideas in fields as diverse as genetics, big data, social science, robotics, and entrepreneurship. 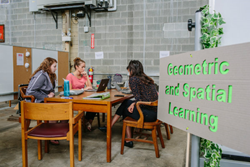 Students focusing on integrating technology and child development to design an app for developing geometric and spatial learning get settled on the first day of Lehigh's Mountaintop initiative. By design, there's an element of unpredictability here. One thing in which I'm confident based on past experience is that collaborations and lines of inquiry that start this summer, for both faculty and students, will persist long after. The fourth summer of Lehigh University’s Mountaintop initiative has officially begun. The initiative brings teams of students together for 10 weeks to explore a new model of education: an interdisciplinary experience focused on self-directed, open-ended questions and developing their own projects. Teams arrived as early as 7:45 a.m. on May 24 to claim their work spaces in Bays C2 and C3 on Lehigh’s Mountaintop Campus, taking over the 50-foot-high industrial spaces that were formerly the state-of-the-art research laboratories of Bethlehem Steel. Team members arranged tables, chairs and large whiteboards, some immediately scrawling questions across them, a starting point for a summer of creative inquiry. Brightly colored signs emblazoned with project names designate the spaces, which will host collaboration, imagination and discovery for the next 10 weeks. Jay Donas, a Ph.D. candidate in history participating in a project called “Asa Packer: An Extraordinary Man in Extraordinary Times,” had heard about the Mountaintop experience before signing up this year. Through their project, the team hopes to tell the story of Lehigh founder Asa Packer, even in the absence of many sources. One of Donas’ teammates, Nia Baker ’19, said she is looking forward to the research experience. “I think it will be a good experience to learn more about Lehigh and about research techniques,” said Baker, who is studying sociology and women, gender and sexuality studies at Lehigh. On opening day, she and her teammates were deciding where to start. Kenji Harada ’16, who studied computer science and international relations at Lehigh, and Lucas Van Dyke ’18, a mechanical engineering student, sat together in their space, anticipating the summer ahead. In their project, “Urban Planning and Transportation at Lehigh,” Harada, Van Dyke and their teammates will attempt to develop a plan for a smarter, more environmentally friendly transportation system for Lehigh. Harada plans to use his computer science background to set up a database to determine the efficiency of different transportation approaches and “hopefully find different problem areas that we can solve in the future.” He likes the open-ended aspect of Mountaintop, he said. “We take it wherever we want, wherever we can. Maybe this project will end in failure, maybe it’ll turn into something great and we’ll redefine the way our campus travels. But really there’s no pressure, and I feel like there’s a lot more freedom to take this project towards the right direction,” said Hamada. The transformation of Bays C2 and C3 is just the beginning of the Mountaintop experience for students and mentors alike.